In plastic injection molding, The sprue is a metal part that links the mold with the injection machine. The sprue can also be described as a part of the runner, which allows the molten plastic material to be injected into the mold through the nozzle of an injection machine.Bolt-type sprue is a sprue that is fixed with two bolts, which helps prevent the sprue from disconnection caused by high injection pressure. Sprue Types: Type A/B/C/D/E, etc. and the three commonly used ones are type A/B/C. A sprue made of hot working die steel SKD61 features the properties of heat/wear resistance. 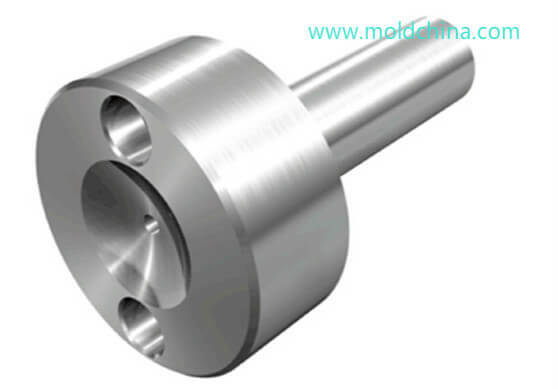 To prevent leakage of plastic materials, the feed throat is usually designed into a chamfer R. The SR (spherical radius) of the mold sprue should be 1 – 2mm larger than the sr of the injection nozzle. 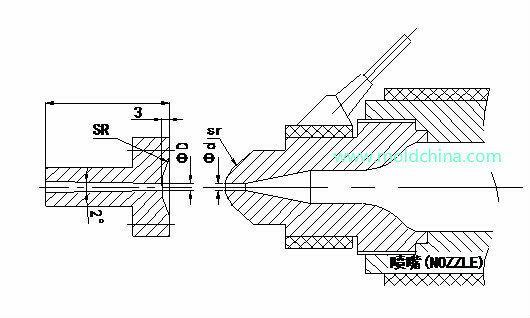 Please refer to injection machine specs for the sr of the injection nozzle. The sprue hole diameter (D) should be 0.5mm larger than the diameter (d) of the injection machine nozzle. 2. The main sprue of a 3-plate mold has to be longer than 25 (including 25). Large sprues must be used. 3. Employ a hot sprue(hot runner) to manufacture products that have high requirements on appearance or other special requirements. Currently, the precision and durability of the sprues produced by Chinese plastic mold parts suppliers are on a par with international advanced level.